The Challenger Learning Center® housed at the Center for Educational Technologies provides students, teachers, and adult learners with simulations that emphasize teamwork, problem-solving, decision-making, and communication skills. We're one of 48 centers worldwide established by the Challenger Center for Space Science in memory of the space shuttle Challenger. More than 30,000 students fly missions each year either at the Wheeling facility or through distance learning. 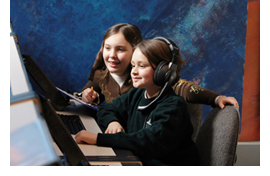 The Challenger Learning Center has been honored nine years for having served the most children of all the centers.Contact us to learn how your school, group, or business can use the excitement of a simulated space mission or other tense challenge to build teamwork and practice science and math skills. Check out our e-Missions™ or our on-site simulations at the Challenger Learning Center website.